Hekima Place welcomes volunteers at our home and campus in Kenya and in our United States administration office. 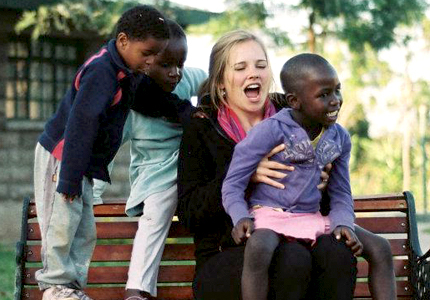 Hekima Place welcomes volunteers to Kenya year round. For volunteers traveling to Kenya, we recommend applying and planning your trip at least several months in advance. We request that you spend at least 7-10 days at the home and actively encourage longer stays when possible. Our volunteers provide supplementary support to the housemothers (mums) and other staff, helping our girls grow socially, mentally, emotionally, and spiritually. We recommend volunteers to Kenya be at least 18 years of age and in good health. *Security documents must be valid within one year of travel. Documents must be received and approved no later than 2 weeks prior to travel dates. Groups of 5 or more must designate a lead volunteer to coordinate documents, correspondence, additional questions or information needed. Please direct any additional questions to our Volunteer Coordinator, Lorraine Bridy. For volunteers whose applications have been approved, additional information on your trip is provided in the visitor guides. Volunteers contribute a great deal to Hekima Place. Hekima Place is home to a large extended family, and our staff and children enjoy welcoming volunteers into our community. Most volunteers will find the time they spend here with the children to be a fulfilling and life-changing experience. Manual labor – assisting with property maintenance, cleaning and gardening. School help – teaching, working as a classroom aid, organizing, supervising children’s activities (academic, sports, arts, crafts) both at Hekima School and at Hekima Place; assisting with homework, reading/playing with small children. Extracurricular program/activity ideas could include computer training, photography, music, drama, cooking, sports, etc. Housekeeping – assisting staff and children with cooking, cleaning and chores. Hours of work vary but volunteers are expected to work with the children at least five days per week. Mutually agreed upon free time will be arranged; however, it is generally expected that volunteers will be present on the weekends when the children are not in school. Volunteers are expected to work closely with the mums who live in the houses with the children, who will have plenty of suggestions on ways to spend quality time with the children. Free time can be spent shopping or visiting local tourist sites, and many of our volunteers take a safari trip at the end of their stay in Kenya.